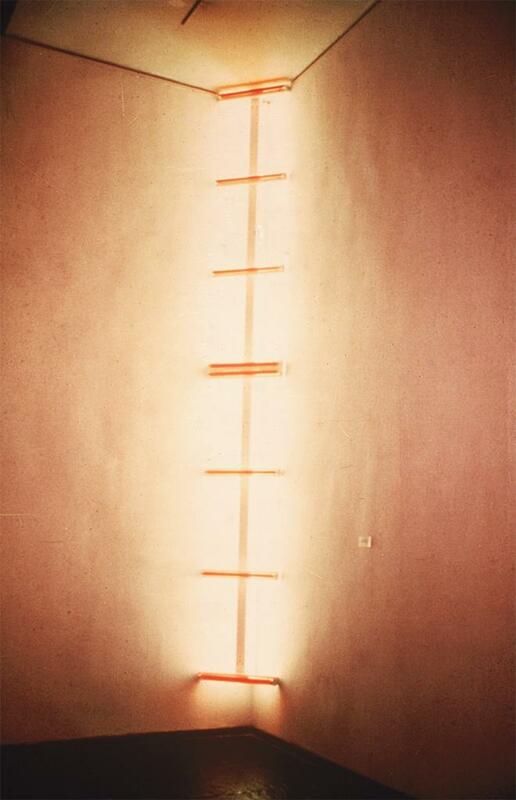 What do you do when one of the lights in a Dan Flavin burns out? If you work at David Zwirner and you’re asked this question, your answer—given unhesitatingly and with complete confidence—is “When one burns out, we go upstairs and get another one.”1 But if you’ve read some of Dan Flavin’s writings or read some of what’s been written about Flavin, you might not be so confident. The “ephemerality of the fluorescent tube,” “its limited life span,” was something Flavin “often spoke about,”2 says Jeffrey Weiss, as, for example, when he remarked in 1962 that although his work takes “the ordinary lamp out of use,” “it is still a lamp that burns to death like any other of its kind” and thus in time, “will no longer be operative.”3 Quoting this remark back in 1965, Barbara Rose made it clear that she thought the fluorescent tube functioned for Flavin as a refusal of what she called “sentimental notions of immortality.”4 So if you agreed with her, and you remembered that Flavin had also said that after the lights burn out “it must be remembered that they once gave light,” you might not be so quick to replace the tube. You might even think that, seeing the work with the lights off—or, even better, seeing the work (as Alex Potts did in Washington in 2004) with one of the tubes starting to flicker at the end—you were now seeing it more truly, not just understanding but also experiencing its ephemerality. My interest in this paper is not in the empirical question of which of these two accounts of the work is more nearly right (or in replacing both of them with some other account), it is instead in the theoretical question of what the accounts are accounts of. Suppose we know nothing about Flavin and, seeing a show of his work, we encounter a great many artifacts with all their lights on and one with one of the lights off. The question we ask is—is that light supposed to be off? This is a question that is in a certain sense separate from the question of what the work means; it’s a question about what it is: is it an arrangement of burning lights or is it an arrangement of lights in which some are burning and one is not? But it’s also inextricably imbricated in any interpretive question since every account of what the work means will already assume some account of what it is. If, in other words, I start explaining to you the meaning of the burnt-out light, I am already assuming that the light is supposed to be out. Of course, it’s a crucial fact about my assumption that it might be wrong, as we can see if we imagine someone who doesn’t make any assumption about whether or not the light is supposed to be out but just declares that the fact that it is out conveys ephemerality to him. This person cannot be wrong about what the light means but only because he can’t be right about what it means either, which is just to say, he isn’t making any claim at all about what it means; he’s just reporting what it makes him think of. If the burned out light leads you to think of the brevity not just of human life but of art too, while it leads me to think just the opposite—look, all we have to do is replace the tube—we are not advancing competing interpretations of the work’s meaning any more than we would be if we had the same argument about, say, a sunset: it’s setting; our lives are short; but it will rise again tomorrow; life itself is long. Reports of what something makes us feel are not beliefs about what it means. And if the recourse to the natural extinction of light seems too strong—after all, no one treats the Flavin as a natural object—then we can just imagine instead a burned out fluorescent tube in our office. It may well produce the same response in all of us—say, thoughts about the limitations of technology and the culture of obsolescence—but it does so not because it’s about obsolescence but because it’s an example of obsolescence. And this distinction—like the distinction between how we are supposed to respond to a work and how we do respond to it—only makes sense by reference to Flavin’s intentions. All fluorescent bulbs will eventually go out; only Flavin’s intentions can make some of them also be about the fact that they will eventually go out. All of us may think of the ephemeral when we look at a fluorescent bulb flickering; only the belief that this (or something else) is what Flavin meant us to think turns our responses into interpretations. There are two points here. The first is that to decide what the work of art is—to delineate the object of interpretation—is always already and only to decide what it is intended to be. Which we do every time we replace a fluorescent tube in a Flavin, and which we also would do if we ever decided not to replace it. And this intention is not some psychological state independent of the work; rather, it is built into the description of the work. Which is why, as Paul de Man suggested a long time ago, our identification of, say, a chair as an intentional object does not require us to know what the carpenter was thinking about as he sawed and hammered it together—it requires only our understanding that, whatever he was thinking about, his actions were undertaken by him under the description of making a chair. The second point is that to say what the work of art means is equally and only to give an account of what it was intended to mean. There are, of course, many important things about works of art other than their meaning—how beautiful they are or aren’t, how influential, how politically effective—and presumably no one thinks that these are matters of intention. No one thinks that a painting is beautiful just because the painter intended it to be beautiful; no one thinks that any work of art actually produces any effect just because its creator intends it to produce that effect. If we did think that, we’d also have to think that there were no unfunny jokes and no bad art. But, of course, you can’t understand a joke without understanding that it was intended to be funny and you can’t understand even the most banal political art without understanding the ways in which it wasn’t supposed to be banal. Which is just to say that there is a logical difference between the effects any work of art actually produces and the effects it was intended to produce and that the interpretation of a work of art has everything to do with the effects it was intended to produce and nothing whatsoever to do with the effects it in fact produces. In this respect, then, intention is—in the exhilaratingly uncompromising words of the call for papers for this session—“fundamental to the practice of all art historians.” Furthermore, it’s fundamental to the practice of just looking at art. Every time you distinguish between what belongs to the work and what doesn’t; every time you have difficulty distinguishing between what belongs to the work and what doesn’t, you are making judgments whose condition of possibility (regardless of whether you are aware of or acknowledge it) is that they are judgments about the artist’s intentions. At the same time, however, the point of this point is hardly obvious. If, after all, intentionalism really is fundamental to everybody’s practice (whether they think it is or not), why bother to assert it? It’s not as if it has much methodological value. The fact that when you’re trying to figure out whether the flickering light exemplifies ephemerality or signifies it you’re trying to figure what Flavin meant it to do doesn’t help you decide what in fact he meant to do. It doesn’t, in other words, help you get the right interpretation; it just explains what it means for there to be a right—or wrong—interpretation. Although (or rather, because) intentionalism is a theory of practice, its practical value is nil, and so the theorist of intentionalism is, if the theory is right, in the position of an investment counselor telling her clients something they already take for granted—buy low and sell high. Of course, there is one difference—the dominant position in interpretive theory has for many years been buy high and sell low. That is, the orthodox view is some kind of anti-intentionalism, usually (in art and literature although not in legal theory, where the opposition to intentionalism is at least as intense but for different reasons) in the form of an appeal to the response of the reader or beholder. Sometimes this involves denying that the intention plays any role in determining the meaning of the work; more often, it involves asserting that it’s relevant but not authoritative, or that the artist cannot control the way the work will be understood or experienced.5 Which is, of course, true but entirely irrelevant, since it confuses meaning with communication, treating the effects of the work as if they constituted its meaning. As I’ve already argued, I think this is a mistake and, as I’ve also suggested, I think it is in most respects an inconsequential mistake. But it’s obviously also proven to be a very attractive mistake, and I’d like to end today by saying something—albeit, given the limitations of time, something very schematic—about its attractions. If, as is sometimes said, postmodernism has been the official ideology of neoliberalism, we might as a corollary add that anti-intentionalism is its official interpretive theory. Producing subjects whose differences cannot be understood as disagreements—we cannot disagree about the effect a work has on us; we can only disagree about the effect it’s supposed to have—the anti-intentionalist valorization of the effect as such provides the technology for a politics defined by alterity and identity, that is by the respect for difference as such. It’s in this world that discrimination (racism, sexism, homophobia) becomes the exemplary injustice and that the injustice of class difference can only be articulated as the stigma produced by that most brilliant of neologisms, classism, as if the harm in deprivation were being condescended to rather than in being deprived. Or to put the point in purely social terms: it’s in this world that the kind of inequalities that make for inefficient markets (racism, sexism, etc.—inefficient because, like unions, they add to your labor costs) are disapproved while the kinds of inequalities produced by efficient markets are allowed to flourish. Thus, where in 1970 the top quintile of American earners made 43.1% of all money earned (and the bottom three quintiles made 32.1%), today the top quintile makes 50% (and the bottom three make 26.7%). Naturally, one doesn’t want to overstate our contribution to this state of affairs: I have no doubt that neoliberalism could have done pretty well even without, say, deconstruction. My point is rather that deconstruction wouldn’t have done so well without neoliberalism, and that the proliferation of anti-intentionalist accounts of meaning has happily coincided with the world-wide triumph of the ideology of competitive markets (a triumph that is seemingly being consolidated rather than jeopardized by the Great Recession). Of course, if the anti-intentionalist arguments are right, the fact that they function also as a kind of auxiliary to anti-egalitarianism doesn’t really matter. In theory, as in libel, truth is an absolute defense. But if, as I have argued today, they are mistaken, their political conservativism presents us with one of those very rare moments where the demands of truth and virtue coincide, and we ought to give them up. The first mistake here is to think of intention as something you can decide (or decide not) to “use.” The minute you wonder whether the light is supposed to be off, you’ve used it. Which is to say, you’ve taken the artist’s intentions as the object of your interpretation. The second mistake is to think of intentionalism as a methodology. Precisely because the intention is the object of interpretation, intentionalism has no methodological value – it’s what you’re looking for, not a way of finding what you’re looking for. But it’s the third mistake, the idea that something else can “figure” in the meaning of the work that—judging by the response of the several hundred people in attendance on the occasion of this session—may be dearest to the heart of art historians today. During the discussion after the papers, intrigued by the apparent (and, in my experience, uncharacteristic) willingness of the audience to accept the position I’d outlined, I asked them as a group whether they were willing to accept not only that the work of art meant what the artist intended it to mean (which they apparently were) but also that it meant only and always what the artist intended it to mean. “But that’s absurd,” exclaimed one of my fellow panelists (I didn’t see which one but, judging both by the charm of the accent and the intensity of conviction, I would guess Thierry de Duve), and the panelist’s incredulity was at least matched by the audience’s. But, absurd or not, it’s true.